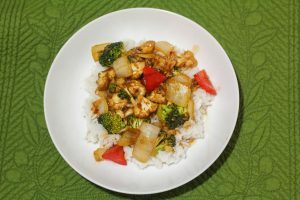 I love asian recipes! After figuring out how to make the best buffalo “chicken” with cauliflower, I decided to create an asian “chicken”. 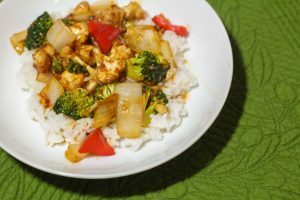 We love spicy in this house so I decided to attempt a gluten free General Tso’s recipe and guys it came out so amazing! My husband is pretty picky with asian recipes so I was pumped to see him go in for seconds and thirds. Nailed it on the first try! Start cooking rice per box/bag directions. 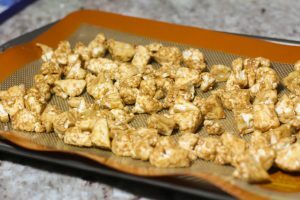 Wash & cut cauliflower head into small bite sizes. Place in medium bowl with 1 tablespoon water. Add 1 tablespoon chickpea flour and 1 tablespoon tapioca flour. Mix in bowl until cauliflower is covered in flour. Place on a non stick baking sheet. While baking, chop up onion, red pepper and broccoli. On an electric skillet add 1 tbsp olive oil and the red pepper, broccoli and onion. Start cooking to brown edges of veggies. Stir occasionally. In a small bowl mix 1/2-1 tsp red pepper flakes, 2 tsp gluten free soy sauce, 2 tps white cooking wine, 4 tbsp ketchup, 1/4 cup brown sugar, 1 tbsp grated ginger, 4 minced garlic cloves, 1 tbsp water. Once veggies are cooked add sauce and baked cauliflower to the skillet and mix until thick and warmed.